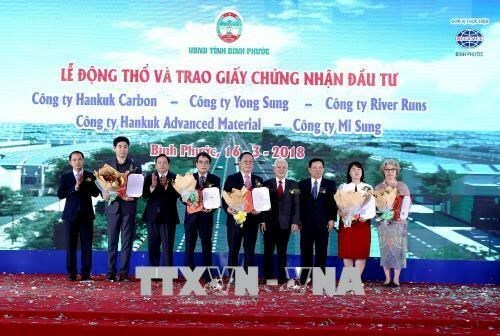 At the event, the provincial People’s Committee handed over investment licenses to the RoK companies - Hankuk Carbon, River Runs, Misung Industrial, Young Sung, Hankuk Advanced Materials. These firms rent 111ha in the complex and have registered to invest a total of 80 million USD in the projects which will produce carbon and glass fiber, and fishing tools. He committed to creating favourable conditions for the investors and requested them complete the projects on schedule. Spanning Chon Thanh town and Nha Bich, Thanh Tam and Minh Thanh communes, the complex is invested by the Investment and Industrial Development Corporation (Becamex IDC) at a total cost of 21 trillion VND (933 million USD), expecting to attract upwards 5 billion USD. The RoK was the second largest foreign investor in Vietnam last year, just behind Japan, with total registered capital of 8.49 billion USD. In terms of accumulative investment, the country ranked first among 125 countries and territories investing in Vietnam, with total investment capital of 57.7 billion USD by the end of December 2017./.